Like no other pistol, Glock pistols permit almost unrestricted compatibility of the magazines within a caliber. Standard magazines, for instance, can also be used for backup weapons. Compact and subcompact Glock pistol model magazines can be loaded with a convincing number of rounds - i.e. Glock 26: up to 33 rounds. The innovative polymer frame of the Glock pistol does not require grip shells. As a result, it has considerably more space for the magazine body and enables double-row staggered cartridge configuration. For this reason, Glock pistols are superior in firepower to conventional pistol models of the same size. 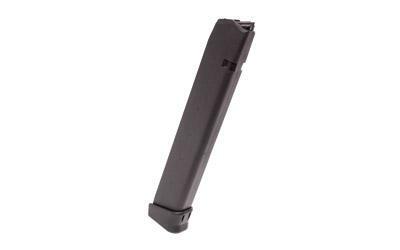 Glock magazines have a stiff metal tube encased in the proven Glock high tech polymer. This resists deformation - even when dropped from great height or exposed to extreme environment conditions.